Department of Personnel & Training, Ministry of Personnel, Public Grievances and Pensions is the nodal agency for framing policy for reservation of Scheduled Tribes. As per Department of Personnel & Training, the benefit of reservation for the Central Government posts and services is provided to the Scheduled Tribes as a composite group and not caste/sub-caste wise. The representation of Scheduled Tribes in the posts and services of the Central Government as on 01.01.2016 is 2,76,007 as against the total employee of 32,58,663, which comes to about 8.4%. 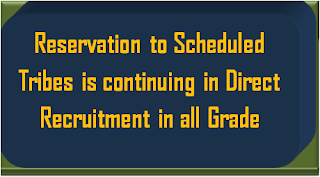 Reservation to Scheduled Tribes is continuing in Direct Recruitment in all Grades. In Promotion, reservation for Scheduled Tribes is available up to entry level of Group ‘A’. No Specific time limit was fixed in DOPT’s OM dated 13.08.1997 for continuing reservation in promotion for Scheduled Tribes. However, this OM was quashed by the Hon’ble Delhi High Court on 23.08.2017 against which Special Leave Petition has been filed by Union of India in the Hon’ble Supreme Court, which is pending. This information was given by the Union Minister of State for Tribal Affairs Shri. Jaswantsinh Bhabhor in Rajya Sabha today. 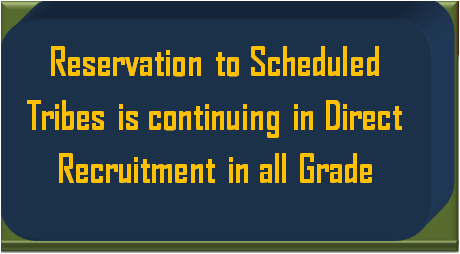 As per Department of Personnel & Training, the benefit of reservation for the Central Government posts and services is provided to the Scheduled Tribes as a composite group and not caste/sub-caste wise.